One of the most photographed scenes in the southwest is towering Cathedral Rock reflected in the waters of Oak Creek at Red Rock Crossing. It should come as no surprise, then, that the picnic area located at that same site is as popular as it is beautiful. People come here to fish, swim, and wade in the creek, as well as to picnic and photograph the scenery. At times it can become quite crowded. But if you come early in the morning or on a weekday, it's possible to have the world class beauty of Red Rock Crossing all to yourself, or nearly so. Fourth graders! The Every Kid in a Park 4th Grade Pass will be honored through 2018! Attractions: Picnicking, waterplay, wildlife watching, photography, and fishing. 8 a.m. to dusk for the summer months. Group site reservations are accepted. Call 877-444-6777 or visit Recreation.gov Single-use sites cannot be reserved. Cash and check only. Credit cards are not accepted. Group Site: $125 (up to 50 people), reservations required. Passes: Grand Annual accepted for entry. 4th Grade Pass honored through 2018! Discounts: Access Interagency Pass (for people with disabilities) 50% off entry. Other Interagency passes are not accepted. Day use only. Camping is not permitted at this site. Every Kid in a Park 4th Grade Pass will be honored through 2018! Only the Grand Annual Red Rock Pass and Big Three Pass are accepted here, or you may pay the daily rate at the gate. Access Interagency Pass (for people with disabilities) receive 50% off the entry fee. Other Interagency passes are not accepted here. This facility has accessible picnic tables and restrooms. Red Rock Country Maps: Download Red Rock Country trail maps and find other Sedona recreation resources. See the Sedona Southwest map for this trail. The Digital Travel Map: Whether you're driving, hiking, riding, or exploring, you will find this full-color, GPS-enabled map a handy reference to have on your mobile device. The map show trails, recreation sites, major landmarks, and forest roads. 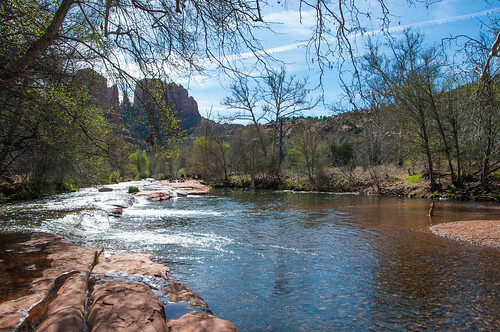 Printed Maps: A variety of printed recreation maps for Sedona and Oak Creek Canyon can be purchased in our local offices and visitor centers, or ordered by phone. Click map thumbnail for a larger view. Can I hold my wedding at Crescent Moon? Yes! However, due to high demand, weddings at Crescent Moon are by reservation only. For parties of 15 or fewer people (including officiant and photographer), reservations may be made by calling the concessioniare at 928-204-0028. Groups larger than 15 are required to rent the ramada; this may be done by calling 877-444-6777 or online at Recreation.gov. See "Wedding Policy for Crescent Moon"
Reservation Info Group ramada reservations accepted at Recreation.gov, or call 877-444-6777 (toll free number), TDD at 877-833-6777.